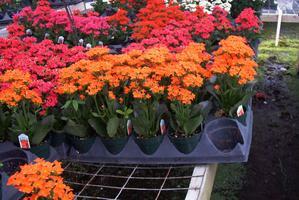 Description: Kalanchoes are in the succulent family. These kalanchoes make excellent gifts or centerpieces and can be kept indoors during the bloom time. Their brightly colored clusters of flowers are found in reds, pinks, oranges, yellows and bi-colors.